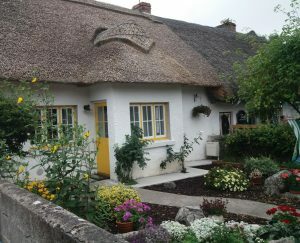 Adare, a designated Heritage Town, is one of the prettiest and friendliest villages in Ireland. It was founded in the 13th Century on the river Maigue. 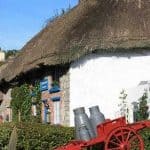 The Geraldines of Kildare developed Adare in mediaeval times and the present village was largely an early 19th century creation by the Dunravens. The building of the Gothic style Adare manor began in 1831. In 1756 John Wesley preached to the people of Adare from under an ash tree near the Franciscan Friary and the tree was still there until about 1860. Today a stone marks the site where this tree stood and the Methodists hold a Field Meeting here in June each year. In the early 19th century, the Earl of Dunraven, laid the plans for the existing streets and townhouses of Adare. These lands and dwellings were rented to tenants under various agreements, some of which still exist today. The main street is punctuated with beautiful stone buildings, medieval monasteries, ruins and a picturesque village park. The streets are lined with the original thatched cottages which were built in the 1820’s by Lord Dunraven. Some of these cottages have changed use and are now restaurants, fashion boutiques and arts and crafts shops. 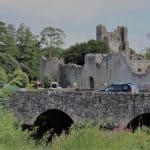 Located in the heart of County Limerick just 15 minutes south of Limerick City on the N21, and 40 minutes from Shannon airport, Adare is the gateway to the southwest of Ireland, bordering the counties of Kerry, Cork, Clare and Tipperary. The Desmond Castle,built in the 13th Century, is located on the edge of the village of Adare, just off the N21 on the main Limerick to Kerry road. The castle was erected with an ancient ring-fort around the early part of the 13th century. It became a strategic fortress during the following turbulent years. It was the property of the Earls of Kildare for nearly 300 years until the rebellion in 1536, when it was forfeited and granted to the Earls of Desmond who gave the castle its present name. Tours of the 13th century Norman Castle operate daily from June to the end of September. Groups may be accommodated outside of these months on request. Tickets are available to book online via PayPal by clicking on the button below, or from the main reception desk at the Adare Heritage Centre. Please note that tours are conducted through English. Multilingual options are available by request, but booking is essential. The Franciscan friary of Adare lies in the demesne of Adare Manor on the east bank of the river Maigue opposite the medieval castle of the earls of Desmond. Access through the Golf Course. 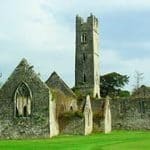 Situated on the Adare Manor Golf Course, the friary was founded in 1464 and while now in ruins, is in fact one of the most structurally complete Franciscan foundations in Ireland. 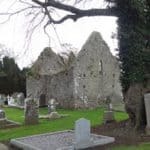 Adare was the first house founded specifically as a reformed or Observant Franciscan house in Ireland, with most other foundations adopting new Franciscan reform in the 1460s. It enjoyed the patronage of the powerful Fitzgeralds during the fifteenth century. Details of the extensive gifts and benefactions received by the friars from local patrons survive in a description of Donatus Mooney, a seventeenth-century Irish Franciscan historian who had access to a now lost register of the friary. In the nineteenth century, the friary was incorporated into the redesign of the estate of the Earl of Dunraven and remains within the grounds of Adare Manor today. Situated next to the Adare Heritage Centre, this is the only recorded Trinitarian monastery in Ireland. It was originally built by the Fitzgerald Clan for the Trinitarian order of monks, who came from Scotland, in the early 13th century. The Trinitarian order of monks was founded in France, following the Holy-Land Crusades, with the main purpose of raising ransom money in order to rescue Christian captives taken by the Moors, during the crusade wars. 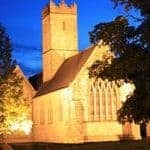 It is believed that the Trinitarian monks who came to Adare may have come from Scotland. The monastery was suppressed and badly damaged during the reign of King Henry VIII. Repaired and enlarged in the mid 19th century, the building is, today, called the “Holy Trinity Abbey” and is used as the local Roman Catholic Church. A visit to this historical and beautiful building is highly recommended. Just a short walk from the village towards Limerick City on the banks of the river Maigue, the priory was founded by the Earls of Kildare in the early 14th century. It was renovated during the early part of the 19th century. It became and remained the home of the Augustinian Order until they were driven out, in the mid 15th century. The Priory was suppressed and badly damaged during the reign of King Henry VIII. Repaired and renovated during the early part of the 19th century, the building is regarded as a fine example of what a mediaeval Irish churches looked like. The building has been used as the local Protestant Church (Church of Ireland) since the early 19th century. St. Nicholas Old Graveyard is located beside Adare Manor Golf Club, on the outskirts of the village. Within the graveyard is the old parish church of St. Nicholas, and several members of the Dunraven family are buried here. Within the graveyard is the old parish church of St. Nicholas, built in the 13th century and then rebuilt in the 16th century. On your visit you will also see the ruins of a second church, a Chapel of Ease, dating from the 16th Century, where several members of the Dunraven family are buried. 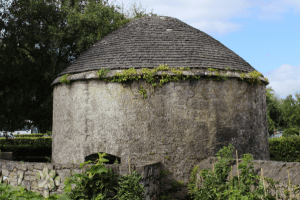 Freestanding circular-plan dovecote or columbarium, rebuilt c. 1850, incorporating fabric of an earlier structure, possibly dating from the mid fourteenth century. Domed slate roof with cut stone eaves course. Rubble limestone walls. Camber-headed opening with cut stone voussoirs and cast-iron gate. Interior walls with square-headed recesses. Its function was to house pigeons, which would provide food for the monks in the abbey. Typical in form of such functional structures, its circular design incorporates an opening in the roof through which birds could enter, while the internal walls are lined with niches providing nesting space. Retaining much of its original form, this dovecote serves as a reminder of husbandry methods once widespread across Ireland. 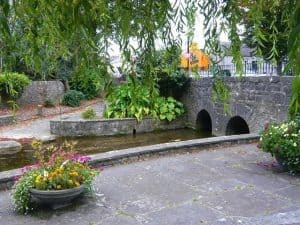 The small pool in the centre of the village is formed by a tributary of the river Maigue and this was the traditional place for the women of Adare to wash their family clothes. It was also used as a watering place for animals. Across the road from the Washing Pool is a stone fountain erected by Caroline, Countess of Dunraven in 1844. A tributary stream of the River Maigue, the Droichidin, flows under a two arched bridge. The pool, dating back over two hundred years, was restored and the banks paved by Limerick County Council and the Adare Tidy Towns Association during European Architectural Year in 1975. Across the road from the Washing Pool is a stone fountain erected by Caroline, Countess of Dunraven in 1844 and since then it has been a favourite meeting place for the people of Adare. 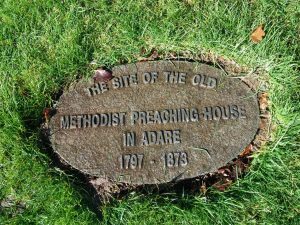 John Wesley, Founder of the Methodist Church, preached to the people of Adare in 1756 from the shade of an ash tree close to the Franciscan Friary. This tree was still there until about 1860. Today a stone marks the site of this tree, and the Methodists hold a ceremony here every June. John Wesley, Founder of the Methodist Church, preached to the people of Adare in 1756 from the shade of an ash tree close to the east wall of the Franciscan friary. This tree was still there until about 1860. Today a stone marks the site where this tree stood and the Methodists hold a ceremony here in June each year. The Stone is located on the Adare Manor Golf Course and the Golf Club closes play on the morning the Field Meeting in June each year to allow the Methodist people and their friends to maintain an unbroken tradition of holding this event, which goes back to 1819. In 1794 the first Methodist chapel in Adare was built on the north side of the road to Patrickswell in the townland of Gortaganniff. The road has since been rerouted, and the site of the chapel is now marked with a stone ( as shown here ) on the fifth fairway of the course in Adare Manor Golf Club. No picture of this building survives, but it was probably of the same simple style as other Methodist chapels of the period. 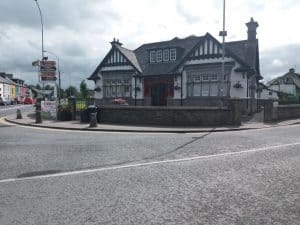 The Lantern Lodge is sited at the roundabout as you approach Adare from Limerick city. This handsome Victorian Gothic Gate Lodge previously gave access to Adare Manor estate. 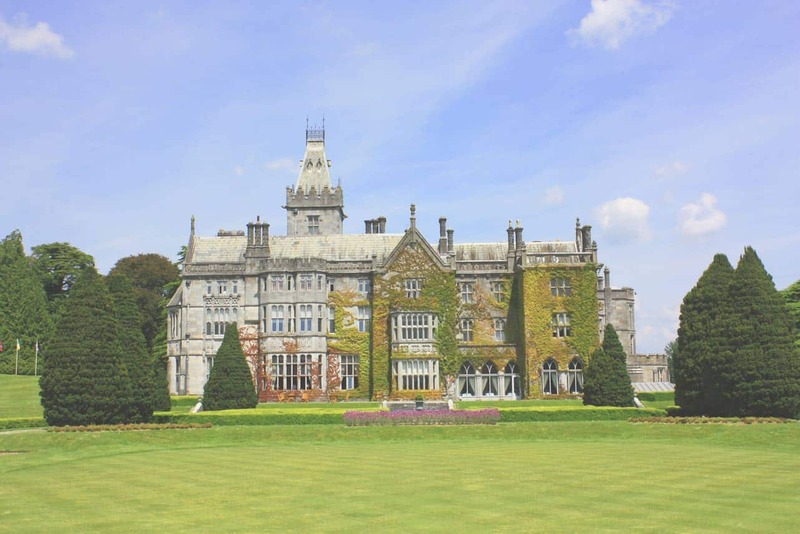 The building is an important architectural contribution to the heritage of Adare and has recently been carefully restored by the owners of Adare Manor Hotel. This octagonal two storey lodge was built c. 1830 of limestone and it has gablets on three elevations, a hipped slate roof and lancet windows and these features mirror the style of the main house. The adjoining stone wall has an inset pointed carriage arch with double leaf ornate wrought iron gates. The Lantern Lodge would have been inhabited mainly by workers on the estate and the census of 1901 records that the gamekeeper Michael Quaid and his family lived there at that time. The Bridge over the river Maigue was built by Gerald, fifth Earl of Kildare, whose earldom extended from 1390 to 1410. It was built between those two dates. The original bridge was extremely narrow and barely wide enough for a cart to pass by. You cross this bridge coming from Limerick. The Bridge over the river Maigue was built by Gerald, fifth Earl of Kildare, whose earldom extended from 1390 to 1410, and so it was built sometime between those two dates. The original bridge was extremely narrow and barely wide enough for a cart to pass by. Chevron-like openings or “v” shaped set-backs were built to one side of the bridge to allow pedestrians to take refuge. These features were retained when the bridge was widened by the Earl of Dunraven. The Village Hall stands at the top of the main street, which is the shopping area for the village. It is built on the site of the old fairgreen and was designed by the Architect, W.Clifford Smith, and was first commissioned in 1909. It is constructed in an English Tudor style. The Village Hall is situated at the top of the main street. The Hall, on the site of the old fairgreen, was designed by the Architect W.Clifford Smith and was first commissioned in 1909. The Earl of Dunraven engaged the young English architect because he had designed a similar building (minus the hall) for the Shannon Rowing Club in Limerick, winning a competition in 1902. Constructed in an English Tudor style with symmetrical hipped ends, it was completed in 1911 by the Earls of Dunraven of Adare Manor for the people of Adare to be their Community Centre. In the early 19th century, the Earl of Dunraven laid the plans for the existing streets and townhouses of Adare. The original thatched cottages were built in the 1820’s, and these were the homes of people employed on the Dunraven Estate. In the early 19th century, the Earl of Dunraven, laid the plans for the existing streets and townhouses of Adare. The original thatched cottages were built in the 1820’s and these were the homes of people employed on the Dunraven Estate; on the farm, in the Manor House and in the cigarette factory. Adare was renowned for the cultivation of the tobacco crop under the auspices of the 4th earl of Dunraven, who had a factory, the Adare Cigarette Company, situated on his estate. The firm employed c. 70 people in grading the leaves into five different categories consistent with their excellence, each being used for a special brand of tobacco. 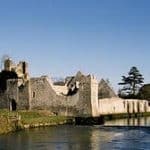 The information provided on each of these historical sites is concise and described in a very simple form to give visitors an insight into Adare’s proud heritage. For additional information we recommend a visit to Adare Heritage Centre, where visitors can book tours of the historical sites. The Christian Brothers School, built of local limestone, is situated on the Rathkeale Road. It was originally a Fever Hospital and then converted into a school in 1853 when the Dunraven family made the building available to the Christian Brothers for a boys school. The Christian Brothers School, built of local limestone is situated on the Rathkeale Road. It was originally a Fever Hospital and later converted into a school. 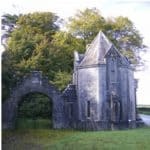 It was given to the Christian Brothers by the 3rd Earl of Dunraven in 1853 and has played a very important role in the education of the young boys of Adare and the region down through the years. The Christian Brothers have now departed the monastery but it continues to operate as a national school. 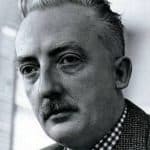 A former pupil, Sean O’Riada, composer, contributed to the revival of Irish music. He lived part of his formative years in Adare. The courthouse, a two-storey building constructed of cut stone external limestone walls and a pitched slate roof with cut limestone copings and cut limestone chimney stacks was built in 1863. 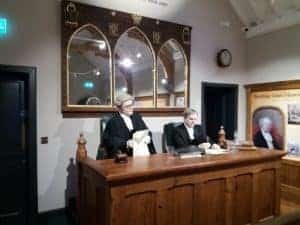 It was purchased in 2017 by Charlie Chawke and it has been magnificently restored with a courtroom theme on the first floor. Adare Courthouse, a two-storey building constructed of cut stone limestone walls and a pitched slate roof with cut limestone copings and cut limestone chimney stacks was built in 1863. It is also thought to have been a Bridewell, where prisoners were held for short terms. It has not been used as a courthouse for many years.This impressive stone building is situated at the roundabout in the centre of the village. The architect was William Fogerty and the construction was financed by the Earl of Dunraven. 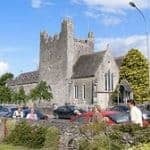 The building and its associated boundary walls make a notable contribution to the village of Adare and additional significance can be attributed to this courthouse due to its close links with local history. Adare Manor was the former seat of the Earls of Dunraven. The house was built in the early 19th-century and retained some of the walls of the 17th-century structure. Until the Manor was complete, the 2nd Earl of Dunraven and his wife, Lady Caroline Wyndham, lived in a Georgian house known as “Adare House” and built in the 1720’s. Adare Manor was the former seat of the Earls of Dunraven. The house was built in the early 19th century and retained some of the walls of the 17th-century structure. It is now a luxury resort hotel. The original house was a “calendar house”, which means a house that architecturally contains quantities that represent the numbers of days in a year, weeks in a year, months in a year and days in a week. It had 365 stained-glass windows and 52 chimneys. Begun in 1832, construction provided work for the people from the village during the potato famine. In 1850 the family consulted architect Philip Charles Hardwick who “with much talent and judgment completed the south and west fronts, after his own designs, following the general plan as intended by the late Earl,” the Earl’s widow wrote. The initial phase of construction was completed under master mason, James Connolly. Along the top of the building an extract of psalm 127:1 is made from carved stone: “Except the Lord build the house, then labour is but lost that built it”. Adare Manor house is set on a 840-acre (3.4 km2) estate and now operates as a five-star hotel, owned by J.P. McManus and features a magnificent 18 hole championship golf course designed by Robert Trent Jones Snr. This cottage, built c.1910, forms one of a group of structures, built to the design of Detmar Blow (1867-1939). Detmar Blow was a prominent architect of the Arts and Crafts movement. 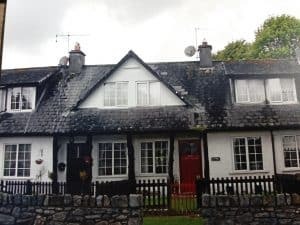 These cottages are designed in a similar style to the earlier nineteenth-century estate cottages of Adare Manor. This cottage, built c.1910, forms one of a group of structures, built to the design of Detmar Blow (1867-1939). Detmar Blow was a prominent architect of the Arts and Crafts movement. These cottages are designed in a similar style to the earlier nineteenth-century estate cottages of Adare Manor. The overhanging roof and timber supports are picturesque features which indicate the influence of the earlier structures. The buildings are notable for the retention of timber casement windows and the timber doors. Together with the surrounding houses, it is prominently sited to the west of the Town Hall and to the north of a village green.